The jobs: Waiter, doctor, farmer, babysistter, teacher, plumber, dentist, fireman. This video is very funny . The job: Waiter ,doctor, farmer, babysistter , teacher, plumber, dentist , fireman. Hello teachers!I like this video. The job: Waiter, doctor, farmer, babysitter, plumber, dentist and fireman. Jobs: a tailor , a doctor , a farmer , a babysister , a teacher , a plumber and a dentist. hello teacher is funny the Jobs.waiter,doctor,farmer,babysitter,plumber,dentistand fireman. Helloo teacher! I like this videoo. The jobs are: waiter,babysistter,dentist,doctor,plumber,farmer and fireman. The jobs are tailor,doctor,farmer,babysitter,language teacher,plumber,dentist and fireman. 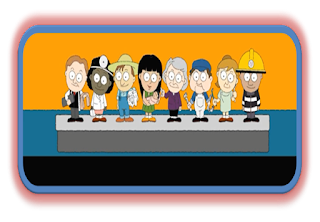 hello teacher the jobs are Waiter, doctor, farmer, babysitter, plumber, dentist and fireman. The job : Waiter,doctor,farmer,babysistter,plumber,dentist and fireman. posdata puse puntos com ati te gustan. hello teacher the Jobs are waiter doctor farmer babysitter plumber dentist and fireman. English, Language, French and Greek, plumber, dentist and fireman. Hello theacher it´s funny and good.